To make a quality ground control points to use for georeferencing in drone mapping software, there are 4 key things to remember. This is an example of a high quality GCP target spray painted onto the ground using a rectangular stencil. Another DIY approach we have seen is a 12" bucket lid stuck on a white plastic 14x14 access panel. Each of these are available at Home Depot, Lowe's, or your local hardware store. Ideal GCP targets could be a large X marked on the ground, a checkerboard mat, or a circular target with a center point. You want to make sure your target has high contrast colors like black & white and that it is large enough to be easily visible from your flight altitude. This gcp was made with a sheet of roofing rubber ($4.66 each) and vinyl stickers ($1 per 6" x 12" sheet) to create a simple checker pattern that is highly weather resistant. The GPS on your phone, tablet, or drone won't cut it! You need an extremely precise GPS measurement to create a quality ground control point. To do this you will need a Real Time Kinematic (RTK) or Post Processing Kinematic (PPK) GPS receiver. Traditional examples include the Trimble R family of products (including the Trimble R8 pictured on the right) but recently low-cost alternatives like the Emlid Reach have entered the market. In this example, the subjects of interest are the 2 star shaped buildings so we place our GCP as best we can around the corners and in center of our subjects. Typically you will need a minimum of 4 GCPs but no more than 10 are usually required even for larger maps. A good strategy is use 5 GCPs located in the 4 corners of your map and the center. As you place your GCPs make sure you leave a minimum 50 ft buffer from your GCPs to the boundaries of your map. In the example, the subject of interest is not a square so we distribute the points as best we can in the corners and center. You can also see some other measurement annotations in blue. To create quality GCPs for drone mapping, your markers must be clearly visible from your flight altitude to be successfully processed. Visual obstructions like overhangs, snow, shade, or glare can make your GCPs difficult to identify in your map photos. In this example, the center GCP is in a heavily shaded area and nearly invisible in the map photos. Know Your GCP's EPSG Code! The first thing you need to do at the beginning of a ground control point mapping project is to pick your GCP EPSG code. If you hire a surveyor to record your GCP locations, ask which EPSG code they will be using. If you are mapping for hire, ask your client what ground control data they require and in what EPSG code. Which EPSG Code Should I Use For My Survey? If you just need an extra-high accuracy map or you need to be able to precisely quantify the relative and absolute error in your map, use WGS84 (EPSG: 4326). If you need to compare your GCP map point cloud or contour lines against existing mapping data, you will need to use the same EPSG code as the existing data. Why do you need GCPs? Relative accuracy is the degree to which the distances between points on a map correspond to the actually distances between those points in the real world. To have high relative accuracy it does not matter where the map is located as long as the it's size and shape are correct. GCPs are not required to make maps with high relative accuracy. Relative accuracy is important when measuring length, area, and volume on your map. 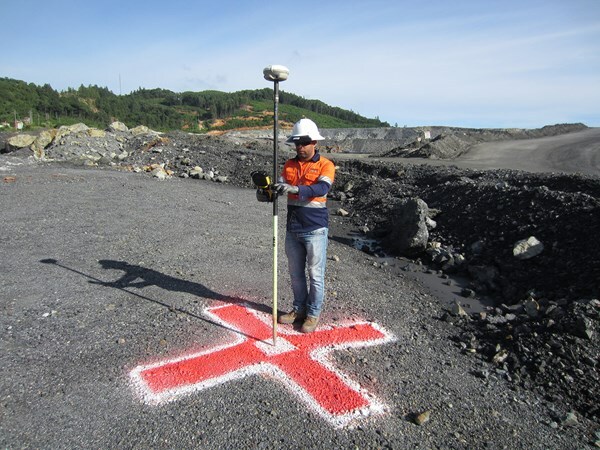 This is also critical for correct spacing of contour lines in an aerial topographical survey. Absolute accuracy is the degree to which the measured position of a point on a map corresponds to its actual position in the real world. To have high absolute accuracy a map must have the correct size, shape, and location when compaired with the real world. GCPs are required to make maps with high absolute accuracy. Absolute accuracy is important when you need to comparing to geo-referenced design documents for a construction project or conducting property boundary surveys. This is also critical for measuring correct elevation values for contour lines. If we created a giant map of Antartica and wanted to measure the shortest distance from the South Pole to the Arctic Ocean we would need high relative accuracy in our map. In the map above, the relative accuracy of North America is perfect but the relative accuracy of Antartica is terrible so it would be very difficult to correctly measure the shortest distance to the ocean. Let's say the distance is really 300 miles and we measured it as 300 miles and 20 feet on our map, the relative accuracy of our measurement would be 20 feet. In our giant map of Antartica example, the absolute accuracy of the location of the South Pole is the difference between where it is on our map and where the real South Pole. If our map has good absolute accuracy like the map above the location of the South Pole and the size and shape of Antarctica will be correct. If our map shows the location South Pole 2 feet to the left of where the real South Pole should be, then the absolute accuracy of that point is within 2 feet. When Do You Need GCPs?